I'm totally not going to comment on the legality of this item (mainly because I don't know), but it seems like kind of a rad thing to own, even if you (hopefully) never need to use it: a handcuff key zipper pull. That's right. It's a normal zipper pull you can attach to any old zipper...or is it? Aha! It is not! 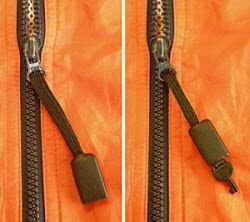 For inside said normal zipper pull is contained a hidden handcuff key. Get it and feel just like James Bond, if Bond wore a parka instead of a tuxedo.